Sukesh Khajuria, in an application, sought action under section 196 of the CrPC against the two for "accepting PoK as part of Pakistan". 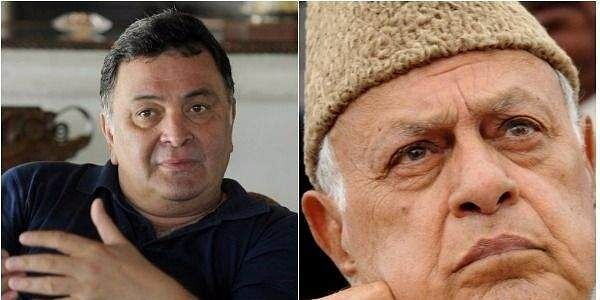 JAMMU: A social activist today filed a complaint with the district magistrate against former chief minister Farooq Abdullah and actor Rishi Kapoor seeking registration of sedition cases against them for their remarks on Pakistan Occupied Kashmir (PoK). Sukesh Khajuria, a former member of the prominent citizen's advisory committee constituted by the state government, in an application sought action under section 196 of the CrPC against them for "accepting PoK as part of Pakistan". In the application, he said they should be booked under section 124-A of the Ranbir Penal Code (Sedition) and other provisions of law. On November 11, Abdullah had told reporters that PoK belonged to Pakistan and "this won't change" no matter how many wars India and Pakistan fight. In his complaint, Khajuria said Kapoor had backed Abdullah and tweeted that "Jammu and Kashmir is ours, and PoK is theirs. This is the only way we can solve our problem". He alleged that Abdullah's statement Kapoor's tweet were "inciting violence" and "public disorder" and fell under the ambit of section 124-A of the RPC.